Maumee Beach near Toledo, Ohio. An Ohio farm in the Lake Erie watershed is suing to stop people from using the Lake Erie Bill of Rights, fewer than 12 hours after Toledo voters approved it. The Lake Erie Bill of Rights amends Toledo's charter to try to give residents a legal basis to intervene in the lake's interests. The big concern for many is phosphorus-containing fertilizers from farms. The phosphorus encourages toxic cyanobacterial blooms. Drewes Family Farms lies along Needles Creek, part of Lake Erie's watershed. The owners say they use best practices to keep fertilizer out of the watershed, but they have to use fertilizer to stay in business, and they say there's no guarantee they can keep all of it out. The lawsuit seeks an injunction to keep anyone from suing on the basis of the Lake Erie Bill of Rights, and also a declaration that it is unconstitutional. Toledo voters have approved a charter amendment giving Lake Erie legal rights by a large margin, 9,867 to 6,211. Turnout in the special election, which also included a referendum on whether to keep the city's jail downtown, was 8.9% of registered voters. The charter amendment purports to allow any city resident to sue to protect the lake. Toledo voters will go to the polls on Tuesday to decide the fate of the Lake Erie Bill of Rights referendum. The referendum would amend Toledo's city charter to give the lake rights, including the right to exist and flourish, and allow any Toledo resident to legally advocate on its behalf. Environmental groups have filed a federal lawsuit pushing for more action to prevent the toxic bacterial blooms that plague Lake Erie's western basin each summer. 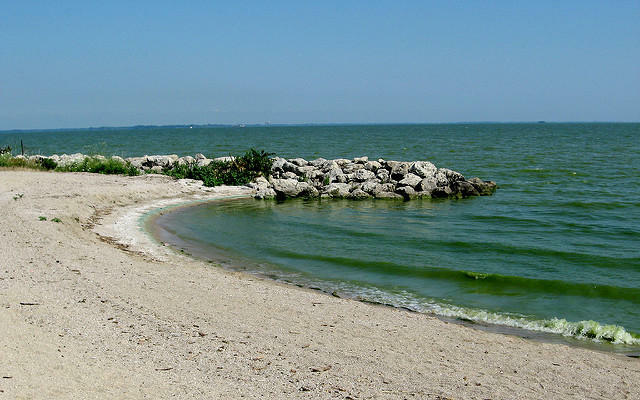 A new study from the University of Michigan shows that blooms of harmful cyanobacteria in Lake Erie are so tough they can survive the winter.